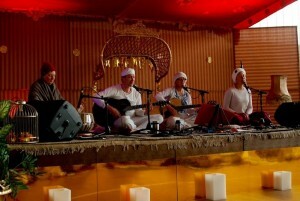 Kirtan combines music and mantra in a meditative and joyful ‘songfest’. The mantras that we use in our yoga classes, sadhana, and related practices are set to music, and everyone who attends is encouraged to sing along with the musicians who lead the event. It is not a musical performance. There are no fancy tunes and solos. On the contrary, the idea is to create an environment that is welcoming, fun and uplifting. There is no pressure to join in with the singing if you don’t want to, but most people find it hard to resist. It’s OK to start quietly if you wish. In the Kundalini Yoga classes, we chant or sing mantras in a set manner. But in kirtan, we can try out harmonies, add in some call and response, and be as inventive and creative as we want. We come together like an impromptu choir and leave relaxed and smiling.